Magmar in game: 952 Who? Important notice! Pokemon Magmar is a fictional character of humans. 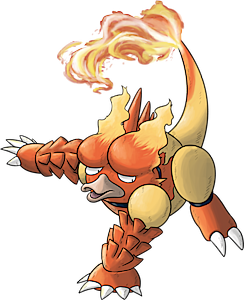 Magmar's body temperature is nearly 2,200 °F (1,200 °C). The anime has shown that extremely well trained Magmar can have the ability to block Electric-type attacks with super-heated air. Because it hates cold places, this Pokémon typically resides in and around active volcanoes. 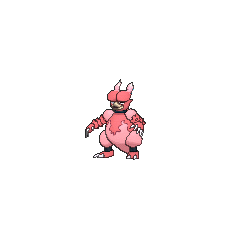 This Pokémon has even been known to alter unfavorably cold surroundings by spitting scorching flames about to warm up the area and establish an environment more suitable to it. Magmar is able to heal its wounds by dipping its wound into lava. 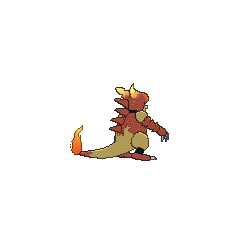 In battle, it blows out intense flames from all over its body as to intimidate its foes and incinerate its surroundings. However, an outmatched Magmar will quickly retreat, using its fiery camouflage and its wavering, rippling glare to blend into any present fires. 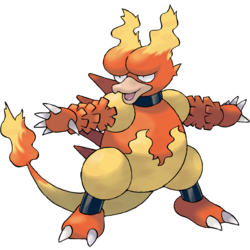 Magmar first appeared under the ownership of Blaine. He used it in the Gym battles against Ash in Riddle Me This and Volcanic Panic. 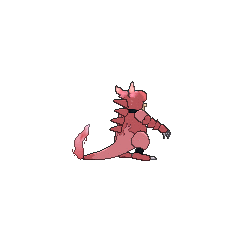 Paul had a Magmar which first appeared in a flashback of his Gym battle with Maylene in Lost Leader Strategy!. Its actual appearance was in Aiding the Enemy!, together with its Trainer. It was used in A Pyramiding Rage! to battle Brandon and his Regice. Magmar gave up on Registeel, despite having a type-advantage and soon lost to Brandon's Regirock, resulting in Paul losing the battle. It evolved into a Magmortar prior to Pedal to the Mettle!. A Trainer named Satchel evolved his Magby into a Magmar in You're a Star, Larvitar!. Gary Oak used a Magmar against Ash in the Silver Conference in The Ties That Bind. A Magmar made another appearance in the Hearthome City Tag Battle Competition in Tag! We're It...!. In Bibarel Gnaws Best, a Magmar belonged to the head engineer. A Magmar who belonged to Yosaku was seen making Charcoal in A Farfetch'd Tale. A Magmar competed alongside its Trainer in a balloon race in The Big Balloon Blow-Up. In As Cold as Pryce, a Magmar appeared in Pryce's flashback as one of the Pokémon which fought against his Piloswine. A Magmar also appeared in Settling a Not-So-Old Score. A Magmar appeared in a picture in An Elite Coverup!. Two Magmar were seen briefly burning up the Pewter Museum in Make Way for Magmar!, where Red battled them using his Sandshrew. Though they were stalled, Giovanni finished them off with his Cloyster. In Just a Spearow Carrier a Magmar appeared with its trainer at the Indigo Plateau. 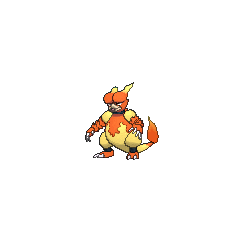 A Magmar was one of the Pokémon sent to help the fight in Ilex Forest in The Last Battle XIII. A Magmar was also seen briefly in Volume 23, under the ownership of a Biker whose gang attempted to ransack Three Island. It was easily defeated by Giovanni's Nidoking and Nidoqueen. Magmar and Electabuzz seem to be counterparts; both evolve in a very similar way (first at level 30, then after being traded holding an "-izer" item), and both are typically exclusive to one version of a pair of games. They both have similar Status-inducing abilities in Flame Body and Static, as well as the same Hidden Ability Vital Spirit. They also learn all their moves at the same levels, such as Fire Punch and Thunder Punch at level 29. They even have the same special moves when purified from Pokémon XD: Follow Me and Cross Chop. Their pre-evolutions and evolutions were released in the same generation. Additionally, their Japanese names are essentially phonetic reversals of each other.